One would think yoga is all about handstands and deep back bending nowadays. However you would be hard pressed to find a yoga text that includes either. Forward bends and seated positions take precedence. This is due to the fact that yoga is meant to take you inwards. 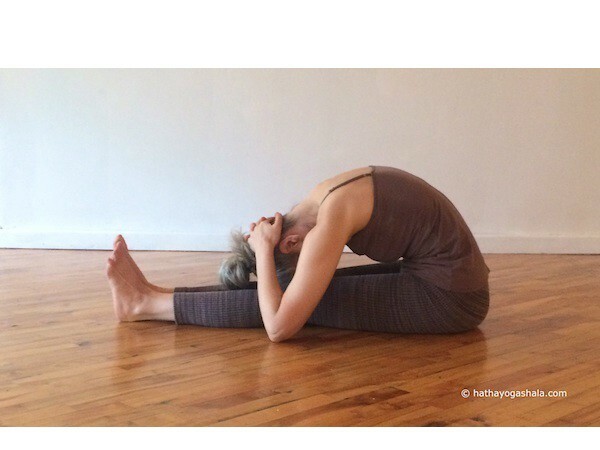 Backbends take you outwards, away from centre, are inhalation dominant and induce extroversion. Forward bends do the opposite, move you towards centre, induce introversion, emphasis is on exhalation, emptying out and invoking a state of surrender. A state that will be required when holding the breath for long periods of time and at the moment of death. Of course one needs both to be balanced while living in the world, however excessive backbends can lead to abdominal and organ bloating, over-stretching of the chest and jamming of the kidneys. 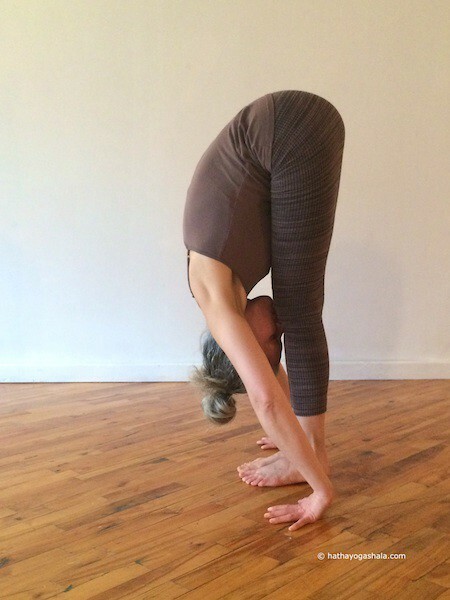 Done incorrectly backbends can increase Vata causing disturbance of air and space. The one or two backbends mentioned in Hatha Yoga texts are performed on the belly, pressed against the floor to minimize any possible negative affects. 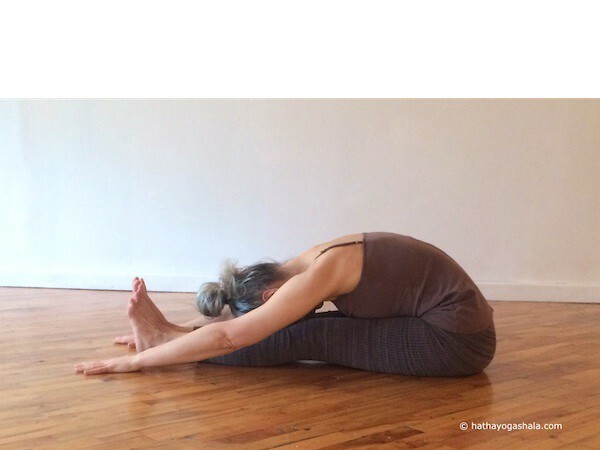 Hatha Yoga texts consider Paschimottanasana among one of the most important positions to practice. It is an intense stretch to the West. The backside of the body is exposed while the front is put to sleep. Most people are too stiff or too mentally resistant to do it for the first few years of their practice. 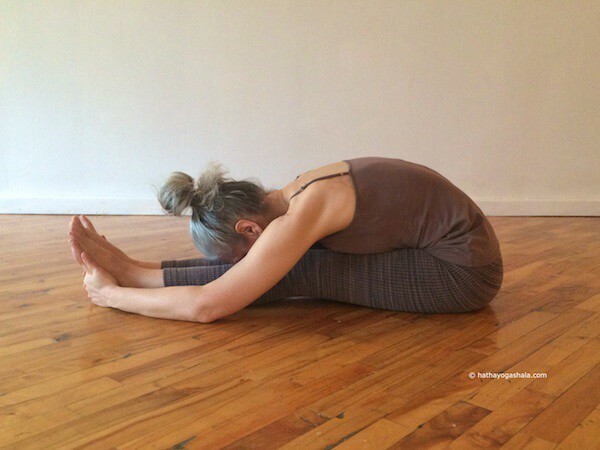 It is suggested to safely learn Uttanasana, intense stretch, in standing first before attempting the seated version. The hamstrings should not be overstretched nor should the ribs or chest be pushed forward. The tendency, and bad habit, is grabbing our feet, pulling with our arms and thrusting ourselves forward to get down. The word ‘forward’ in forward bending causes confusion as we don’t actually want to pull forward and be taken off our seat base. Rather it’s a folding in. When done in sitting, the central flame Agni points up towards the gateway of Shushumna Nadi, the central channel in the middle of the spine, key to the Hatha Yoga practice. It is also good for reducing excess fat and Vata, pushing mucous and congestion from the channels, squeezing heaviness and lethargy out of the system bringing lightness. It helps with digestion and stretches the nerves and bladder meridian on the whole backside of the body. When I first started yoga I could barely touch my feet, my hamstrings were stuck in my sitting bones and I shook just trying to sit upright with my legs straight out. Each time I bent over the tissue around my sacrum and lumbar burnt and felt as if it was being torn off the bone. With patience and proper preparation in standing first, over time things loosened, I learnt how to move from deeper inside, I allowed myself to stay longer in sitting and not panic. Some people naturally bend in half but just go to sleep when in the pose. They will need to engage more and not collapse into themselves. Firmness is required in both body and mind. Pressure through the heels and inner legs will help to stay awake and aware. If your wrists pass your feet in variation 2, interlock the fingers around the feet for the full position as shown at the beginning of this post. A qualified teacher is always necessary and every spine is different. This posture takes years to learn and understand the internal workings of. Injuries are quite common with forward bends in sitting positions when the student is not yet ready. When properly prepared and executed, Paschimottanasana will teach you just how much you are willing to let go and travel inwards. Radhasri (Rhonda Fogel) has been teaching yoga in Canada since 1998 and is the founder of Hatha Yoga Shala currently based in Montreal. 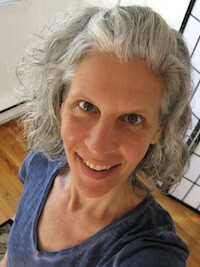 She is an authorized Shadow Yoga teacher since 2005. She can be found here on Medium as well as on Facebook, Instagram or her website.